Thielaviopsis basicola (Berk. & Br.) Ferraris is a soil inhabitant that attacks more than 100 plant species in 33 families. Members of the Fabaceae, Solanaceae, and Cucurbitaceae families are especially affected by T. basicola (5). The common name 'black root rot' is based on darkly pigmented chlamydospores that form in the root cells of hosts and giving a 'blackened' appearance to the root tip (2). The black root rot fungus is a member of the Hyphomycetes, order Moniliales, family Dematicaceae (5). General symptoms are root rot and branch dieback. Thielaviopsis basicola can be found in all regions of the world, especially in regions with cool climates.Black root rot can affect a wide range of woody and herbaceous plants including tobacco, holly, begonia, geranium, poinsettia, and pansy. A variety of natural media, including potato-dextrose agar and carrot-extract agar (4-8%) can be used to grow T. basicola in culture (5).The fungus, however, grows poorly on synthetic media and cannot utilize nitrate nitrogen (5). The optimum temperature range for growth in culture is between 22 and 30 ºC.Optimum pH for growth in culture is between 4.0 and 6.0, but can vary depending on the substrate used and the amount of calcium available to the fungus.The addition of calcium ions can greatly increase the growth of T. basicola (5). A selective media, developed by Specht and Griffin, composed of 4% carrot extract amended with etridiazol, 400mg; nystatin, 250,000 units, streptomycin sulfate, 500 mg; chlorotetracycline hydrochloride, 30 mg; CaCO3, 1 g; agar, 15 g; and deionized water, 1 L, is effective in the recovery of T. basicola from the soil and plant tissue.The fungus, however, exhibits instability and variability in culture (5).Spores of wild-type isolates should be stored in sterile sand culture to maintain virulence since isolates can rapidly lose virulence on agar media (5). The fungus reproduces asexually by the production of two types of condia, endospores and aleuriospores (chlamydospores) (Fig. 1).Chlamydospores are produced in chains (two to eight spores per chain). The dark, thick walled chlamydospores (25-65 X 10-12 mm) separate at maturity and each cell is capable of germination (Fig. 2). Endoconidia are produced in greater numbers than the chlamydospores. These spores are variable in size (8-30 mm X 3-5 mm), with slightly rounded ends (1, 2, 5). Mycelium produced by T. basicola can be cinnamon to light brown or gray to light black. The septae hyphae are hyaline at first and become pigmented with age (2, 5). A sexual state has not been observed with T. basicola. 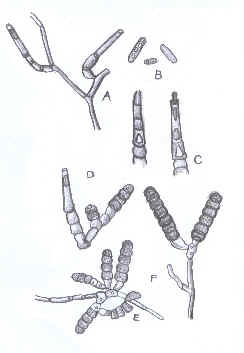 Numerous blackened root tips of host plants characterize infection with T. basicola (1).Young roots are black, with discrete lesions or lesions along the entire length of the root (5). Infection can occur at any time during the growing season. Aboveground symptoms with seedlings are stunting and a pale green to yellow discoloration of leaves and shoots. Infected seedlings have poorly developed root systems and may be killed. Black root rot is a widespread and destructive root disease of pansy in both landscape and nursery pansies. Black root rot is most prevalent when conditions are stressful to the host plant (3). The disease can be a problem with other floral crops including cyclamen, hybrid impatiens, poinsettia, and annual vinca. Pansies infected with black root rot produce aboveground symptoms that are typical of other root rotting diseases and include stunting and/or wilting of plants and yellowing (chlorosis) of the foliage (3, 4). In early stages of the disease, the roots, which are normally white, develop dark spots or bands. Early symptoms may be more prevalent in secondary feeder roots. In advanced cases, the root system becomes black and water-soaked. The disease is a problem during all stages of growth and can be especially destructive during the late summer months when temperatures are high (3). Endoconidia and chlamydospores geminate and infect host plants. Penetration of host tissue occurs directly without the formation of appressorium, or through natural openings and wounds (1, 5). The colonized cortex and vascular tissue is the site of chlamydospores production. Both endoconida and chlamydospores are produced on the root surface. Spores are easily moved in soil water. The fungus can also be transported on transplants. Soil temperatures between 55 and 65°F generally favor this fungus, particularly if the soil is wet (5). Commercial peat moss has also been found to harbor T. basicola. The fungus is spread when healthy roots come in contact with infected roots or infested soil. Spores of the fungus can also be spread from pot to pot by splashing water. The disease is sometimes spread when introducing infected plugs into a new area. Black root rot fungal spores can survive in greenhouses for several months on plant debris under benches. Black root rot is more severe in with cool soils (17 and 23 ° C) that are below the optimum range for both the fungus and the host plant. The disease is most severe at temperatures unfavorable for host growth. Disease can develop over a wide range of soil moistures, but wet soils appear to be an important factor (5). Soil acidity is an important component for the management of this disease. Disease symptoms are not as severe below pH 5.6. Liming has been found to increase disease severity by unknown mechanisms (5). The cropping history (level of host resistance/rotational crops) and soil type can affect the inoculum levels and density required to cause significant disease incidence and severity. Crop rotation is recommended for management of black root rot affecting tobacco. Decomposing residues from some green manure cover crops (i.e. barley and rye) should be avoided because they may predispose roots of resistant tobacco cultivars to T. basicola (5). Leguminous cover crops can cause populations of T. basicola to reach high levels and should be avoided (5). Multigenic resistance of N. tabacum is available and provides levels of low to high resistance. Complete resistance is available with N. debneyi with a single gene resistance to the common race of T. basicola (5). Soil fumigants, such as chloropicrin, can be helpful for control in the seedbed and sterol inhibitors (triazoles) also have activity against T. basicola (5). Maintaining a soil pH near 6.0 can also be effective for managing black root rot. 1) Agrios, G.N. 1997. Plant Pathology 4th ed. Academic Press, San Diego, CA. p. 358. 2) Alexopoulos, C. J., Mims, C. W. and Blackwell, M. 1996. Introductory Mycology., 4th Ed., 869 pp., John Wiley and Sons, New York. 3) Daughtrey, M. L., Wick, R. L., and Peterson, J. L. 1995. Compendium of Flowering Potted Plants. APS Press. St. Paul, MN. 90 pp. 4) Lambe, R. C. And McRitchie, J. J. 1986. Diseases of Woody Ornamental Plants and Their Control in Nurseries. North Carolina Agricultural Extension Service, Raleigh, NC. 130 pp. 5) Shew, H.D. and Lucas, G.B. editors. 1991. Compendium of Tobacco Diseases. APS Press. St. Paul, MN. p. 28-29. I would like to thank Dr. H. David Shew and the Dept. of Plant Pathology, NCSU for providing me with the images for this web page.